Eventing could be termed an “equestrian triathlon.” It involves working with a horse both on the flat and over fences. The three phases are: dressage, endurance (or cross-country), and show jumping. Over the centuries it has developed from the test of the ideal military charger. 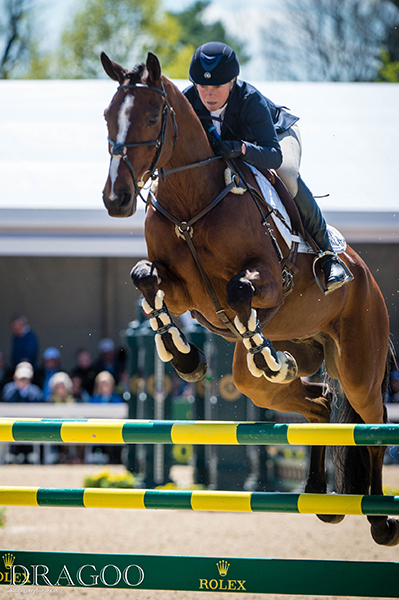 Eventing has now evolved into an exciting sport attracting interest from all levels of sports enthusiasts, from weekend hobby riders to professional international stars. The cross-country test takes place on the second day of competition. The object of this test is to prove the speed, endurance, and jumping ability of the horse over varied terrain and obstacles. In order to accomplish this task, the horse and rider must be at peak condition. The horse must be brave and obedient, and the rider must use knowledge of pace in order to expend only as much of the horse’s energy as necessary, if they expect to finish well. In the words of the FEI (international governing body for equestrian sport) rulebook, “The test on the third day is not an ordinary show jumping competition…its sole object is to demonstrate that, on the day after a severe test of endurance, the horses have retained the suppleness, energy and obedience necessary for them to continue in service.” The show jumping course requires very exact riding; it consists of between 12 and 15 show jumping obstacles, which normally include at least one combination, two spread fences, and in some cases a ditch. The courses are designed to test the horse and rider’s ability to negotiate a variety of fences of differing heights, widths, and technicality. This requires the horse be balanced and supple for tight turns and short distances between fences. He must be able to lengthen or shorten his stride in an instant. Therefore, the rider must know exactly where he is on the approach to a fence, with an obedient horse that will respond to his commands. For the spectator, this sport is both exciting and breathtaking to watch, as just one single rail knocked down can change the final standings dramatically. At the end of the competition, scores for all the competitors are totaled. Each test is scored individually and the penalties incurred are added together for the final results. The lowest score is the winning score. In the case of a team competition, the individual scores of each of the team members are added together. If all team members have completed the competition, the best three scores count and the team with the lowest team total is pronounced the winner.